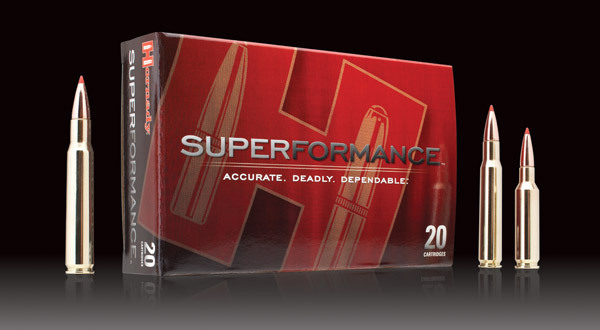 Looks like Hornady has done it again with the new line of Superformance ammunition, safely boosting velocity 100 to 200 feet a second for cartridges from .243 up to .458 Winchester Magnum. The new line is offered in 54 combinations of cartridge and bullet weight, featuring Hornady SST and their new GMX bullets. There’s even a super-charged 12-gauge 00 buckshot load. In a nutshell, Superformance cartridges use a milestone in powder technology to broaden the pressure curve, safely holding higher pressures longer, thus producing more velocity with less powder, and at the same safe pressures. The breakthrough involves both the chemistry of the powder and the mechanical processing of the granules. Since 1995, Hornady has offered Light and Heavy Magnum ammunition, compacting large volumes of slow-burning powder to achieve higher than normal velocities. But most powders do not fully burn by the time the bullet exits the barrel, and larger volumes of powder can increase the recoil-boosting “rocket effect” of these gasses exiting the barrel. In contrast, Superformance powders completely burn by the time the bullet exits the muzzle. A higher percentage of the energy is transferred to the bullet, and muzzle exit pressure is lower as is the velocity of the muzzle gasses. This minimizes bullet velocity loss in short barrels while also reducing the rocket effect. A great deal of felt recoil actually comes after the bullet leaves the barrel, caused by the barrel acting like a rocket as still-burning powders and expanding gasses jet out the muzzle, pushing the rifle sharply back into the shooter’s shoulder. Because the new powders completely burn before the bullet exits the muzzle, the jetting effect is significantly reduced. The lower weight of the powder charge itself also lessens recoil. It long has been an axiom in the gun trade that more potency means more recoil. We may have to rethink that. For years, hunters have been staying with lesser cartridges to avoid the punishing recoil of newer, more potent loads, selecting, say, a .30-06 instead of a .300 Winchester Magnum. But with Superformance, a hunter can get close to .300 magnum velocity with only slightly more recoil than a regular .30-06 load. Noise and muzzle blast psychologically contribute to the perception of recoil, and that will also be much lower, perhaps even lower than with a regular .30-06. In addition, the new powders are much less sensitive to temperature change than are most older powders. This new technology is doing more than just boosting velocity. Consider the Hornady .338 Marlin Express, a collaboration between Marlin and Hornady. The cartridge transformed the Marlin lever action into a truly long-range rifle for bigger game, perfectly adequate for elk, moose, bear, and even African plains game out to 400 yards. Marlin has long offered potent cartridges in lever actions for big game, the .45-70, their own .444 Marlin and more recently their .450 Marlin. But the large-caliber bullets are relatively fat and slow, resulting in rainbow trajectories that limit range. One might also say that the .30-30 slab-sided lever action carbine, when fed heavy 170-grain loads, is an adequate elk gun, but only at close range. The problem is elk like big country where long shots are common, and elk hunters who might have preferred a compact lever gun instead chose a bolt-action chambered for a longer-range .270, .30-06, or an even faster and flatter shooting .300 or 7mm magnum. Hunters preferring a bit more bullet for an 800-pound elk, and able to handle the recoil, may step all the way up to .338 Winchester Magnum, considerd by some the ideal elk cartridge. It delivers more bullet weight than the .30s, yet the bullet is still slender enough in shape to have a high ballistic coefficient. Yes, the .338 bullet is an excellent choice for elk at extended range. Even the milder .338 Federal can deliver 1,581 foot-pounds at 400 yards. Using the pointy rubber-tipped LEVERrevolution bullet, which can be safely loaded in a Marlin lever gun’s tube magazine, Hornady made a very aerodynamic .338 bullet with a ballistic coefficient of .430, same as the Hornady .308 with its 180-grain Spire Point. This new 200-grain .338 was chosen as the best combination of weight, velocity and ballistic coefficient for long-range performance in the .338 Marlin, duplicating both the energy and the trajectory of a 180-grain .30-06 out to 400 yards but with the larger diameter and heavier .338 bullet. Hornady says the new 200-grain bullet’s tough construction is specifically designed for elk, moose and African plains game. The cartridge is based somewhat on the .376 Steyr, a powerhouse that launches a 270-grain bullet at 2,600 feet a second with 4,052 foot-pounds of muzzle energy. They shortened the case a bit and added a slight rim for the Marlin lever action; the 200-grain .338 bullet leaves the Marlin 24-inch barrel at 2,565 ft/s with 2,921 foot-pounds of energy. Sighted in to hit 3 inches high at 100 yards, it hits 1.2 inches high at 200 yards, drops 7.8 inches at 300 yards, and hits just 25.9 inches low at 400 yards. That’s manageable drop for a practiced rifle shot taking aim on an animal the size of an elk, and even way out there at 400 yards, it hits with 1,471 foot-pounds. That’s elk medicine in anyone’s book. Marlin makes two rifles for the cartridge, one stainless steel with a black and grey laminate stock and one with a more traditional blued finish and a hand-checkered walnut stock. Each has a five-shot magazine, pistol grip and 7 pounds total weight. The stainless model has a 24-inch barrel while the blued version sports a 22-inch barrel. The one common complaint about the Marlin .338 has been difficulty finding ammunition on gun store shelves. But judging from the way Hornady seems to be gearing up for Superformance ammunition sales, there should be plenty of it on dealer shelves this fall. But, just to be sure, you might want to get yours early. Over the past 15 years, Hornady has certainly earned its reputation as the innovator in cartridge design. In 1995, they began offering the Light and Heavy Magnum ammunition, boosting velocities from 100 to 200 ft/s for many popular hunting cartridges. Say you hunted deer with a .30-06 but thought you needed a new rifle in .300 Magnum to hunt elk. Instead, you just bought a couple of boxes of Light Magnum ammunition, and the .30-06 was elevated almost to .300 Magnum performance. Light and Heavy Magnum required extra loading steps, which made the ammo more costly; it also generated more recoil and muzzle blast than standard loads. But it delivered enough of a performance boost to develop a following. We began to see real hints of what was to come when Hornady and Ruger announced the .375 Ruger. It has a much shorter case yet equals the velocity of the great .375 H&H, and it achieves those equivalent velocities in a considerably shorter barrel. Other high-performance innovations, the .30TC, the .300 and .338 Ruger Compact Magnums, the .308 and .338 Marlin Express, soon followed. From Light and Heavy Magnum ammunition, to the .450 Marlin, to the .17 HMR, to LEVERevolution ammunition, to the .375 Ruger and .30TC cartridges, to the .300 and .338 Ruger Compact Magnum cartridges, to Dangerous Game bullets and ammunition, to the .308 and .338 Marlin Express, 6.5 Creedmore and 6.5 Grendel, Hornady has been leading the way with premier hunting cartridges as well as target ammunition. This year, they may be rewriting the standard by which everyday rifle ammunition is judged. Superformance doesn’t cost much more than standard hunting loads. Everything about the new cartridges seems, well, super.